Welcome to the “K League Tactics” series. Here we’ll take a look at each of the 12 K League Classic teams, and later the K League Challenge automatic promotion and playoff contenders. Hopefully, each entry (coming out weekly on Sunday/Monday) will give you an introduction to each team. Note – These are being written as the season is being played, so players/managers may come and go, and things may change after the posts are up. First up is last year’s AFC Champions League runner up, FC Seoul. Seoul has struggled this year, and despite being three months(ish) into the season, Seoul is closer to the relegation spots than the championship. Why is that? And can they make a late push for the championship or AFC CL spots? Seoul is notable for being the only team that regularly uses a three-man backline. Variations exist, of course, within the team in terms of shape and personnel, but the above XI is probably Seoul’s “ideal” line up (or close to it). Mauricio Molina recently returned from injury to assist the attack. Prior to his return the Brazilian Rafael Costa had played up top as had Park Hee-Sung and Kim Hyun-Sung with mixed results. Go Yo-Han has also featured often for Seoul, usually interchangeably with Escudero or Yoon Il-Lok. The two central midfielders, Ko Myeong-Jin and Kang Seung-Jo have usually been the preferred duo, but in the recent Supermatch between Seoul and Suwon, Spanish defender Osmar was pushed up into midfield at Kang’s expense. It remains to be seen if that move is one that Choi Yong-Soo will do regularly. Seoul’s defense has been it’s most consistent area on the pitch. Kim Chi-Woo and Cha Du-Ri play as the left and right wingbacks respectively. The back three is usually club captain Kim Jin-Kyu, Kim Ju-Young, and the aforementioned Osmar. 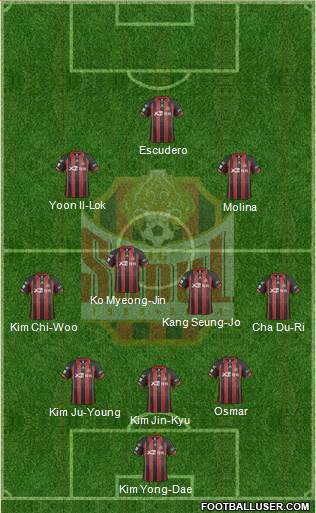 Lee Woong-Hee occasionally will step in as well (such as when Osmar went into midfield). Kim Yong-Dae is the team’s usual starting goalkeeper. Defensive solidity – Seoul is solid at the back, and as a result the team has conceded just 11 goals in their 15 matches played – third best in the league behind Seongnam (9) and Jeonbuk (10). The usual midfield pairing of Ko Myeong-Jin and Kang Seung-Jo aren’t particularly adventuresome in terms of going forward in attack, so Seoul will often have at least five players in defensive positions, effectively clogging the middle. While Kim Chi-Woo and Cha Du-Ri will regularly go forward, they are both high energy players and can get back in position quickly. Pace in attack – Both Escudero and Yoon Il-Lok have plenty of pace and direct running ability, which makes them both threatening on the break. The return of Mauricio Molina adds to that threat. Lack of finisher – While the attack has plenty of pace, they lack a true center forward, and that’s probably the biggest difference between last year’s Asian Champions League runner up and this year’s side. The team was unable to adequately replace the departing Dejan Damjanovic, and has struggled for goals (just 11). Yoon Il-Lok and Sergio Escudero lead the team with two each, but neither are natural forwards. In reality the formation is really more of a 3-4-3-0. Weak midfield -> attack connection – Seoul, as well as the K League in general, lacks a natural #10, and there is often a big gap between the front three and the deeper two. 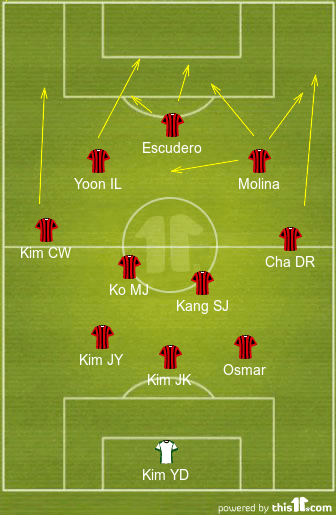 Ko Myeong-Jin is more comfortable spraying long passes and both Kang Seung-Jo and Osmar are more defensive minded. While Seoul misses Dejan up top, here they miss former captain Ha Dae-Sung and his ability to connect the midfield and attack. In short, Seoul’s normal pattern is to play more on the direct side. The front three attack narrowly, forcing the opposition fullbacks to pinch in to close the space. That opens up the flanks for the two wingbacks to push higher and provide width. Seoul is most dangerous though on the break, when their attackers can utilize their pace to attack the spaces. The return of Molina adds another wrinkle to their counterattacking ability as he is comfortable both playing centrally and out wide. Molina also has the best passing ability on the team, and he can play dangerous through balls to the other two attackers or the wingbacks coming wide. Seoul is a difficult team to score against, and they’ve yet to concede more than twice in a game or lose by more than one goal. But, there are some effective ways to attack them. Attack the space behind the wingbacks – The most obvious tactic when playing a team that uses a back three/five. Kim Chi-Woo and Cha Du-Ri will leave space behind them when they go forward, so it’s important teams attack that space and draw the centerbacks out of position. Counterattack with pace and conviction – Meaning run at those centerbacks. Kim Jin-Kyu, Kim Ju-Young, and Osmar are all solid defenders, but they’re not entirely convincing when players run at them at pace. Keep defensive transitions organized and compact – Seoul’s attacking three are dangerous on the break, but they’re all a bit lightweight. Letting them pass out wide to the wingbacks is a fairly safe option as they won’t challenge much in the air. Play long balls down the middle – Unless you have a Kim Shin-Wook-like player who can battle and challenge any centerback, trying to win aerial battles consistently against their back three is a losing decision. Seoul will rarely be troubled and will also likely win the second battle for the ball with their two deeper holding midfielders. Leave your defense exposed – Devoting too many resources to your attack is also dangerous. Seoul’s front three will trouble any defense in Korea and with virtually all teams playing a back four, leaving the two centerbacks on their own is asking for trouble. Seoul can easily create a numerical advantage on the break and create good chances for them to score. Be tentative in attack – Seoul will regularly have five or seven players back in defense (if not more) so committing three or four attackers is not likely to find much success. Point 3 might seem to conflict with point 2, and it does to an extent, but teams must be intelligent in when and where to commit extra attackers to create overloads and mismatches. Seoul’s problems largely stem from their lack of striking options. If they can make a move for a decent striker in the summer window (they should have some cash around from the sales of Dejan and Ha Dae-Sung) then it’s possible they can make a late push and at least finish in the top half. Seoul has the players to create chances, but they desperately need someone up top to finish them off. The team is well organized tactically and each player seems to know their role within the set up. Is there a K League team you’d like to see reviewed next? Leave a note in the comments. Great idea Jae. Love how you’re covering the K League clubs. OMG yes. This is a good idea Jae. Personally I’m curious on why Incheon isn’t scoring or hardly this year. If I get to have a “request” for a tactical review it would be on that. Incheon will be next since I just watched them live against Busan. Daejeon will maybe come much later this season, when it’s closer to the promotion playoffs. Will probably try and do a look at the auto promotion team and the four playoff contenders from Challenge. Nice, can’t wait to see your tactical review of Incheon! Thanks, Jae. At least FC Seoul will be first at something this year. The Jae Chee K-League Classic Reviews! Great analysis! Thank you for that. I would love to see an article on Gyeongnam FC. They have not been doing very well so far this season, but it seems to me that they are ranked below their potential. Gyeongnam is an interesting team. They’re very open and attacking which can make for a nice spectacle. I’m doing Incheon next week, but will chalk up Gyeongnam after them.